The affordable housing crisis has been a central focus of policies and elections in recent years in Los Angeles County and across the state of California. Half of California’s households struggle to afford a roof over their head, and homeownership in the state — once a pillar of the American dream, and a primary form of wealth-creation — is at its lowest rate since the 1940s. In Los Angeles County, 31% of renters are severely cost burdened, meaning that over half of their income goes to rent each month. Much research has shown how the housing crisis affects Los Angeles residents in their roles as renters and homeowners, but less work has been done to show how these issues affect business and employment in our region. Recently, the Los Angeles Business Council (LABC) partnered with USC Price Center for Social Innovation on a report to examine how the high cost of living and housing have affected employers and employees. According to the 2018 report, two of the fastest growing industries in Los Angeles are (1) Professional, Scientific, and Technical Services (PSTS) and (2) Accommodation and Food Services (AFS). Between 2004 and 2014, Los Angeles County added almost 58,000 jobs in PSTS and 86,000 jobs in AFS. Despite sharing a commonality of working in fast growing industries, however, workers in PSTS and AFS are facing different housing challenges as more jobs become available. PSTS employees include accountants, engineers, lawyers, and researchers, among others. In the Professional and Scientific industry, average annual wages are $87,400, which is significantly higher than the national average of $59,904. In Los Angeles County, neighborhoods with the highest percentages of residents working in the PSTS sector are heavily concentrated on the west side of the county. Median incomes in this region are also well above the county average. Despite working in a growing sector with high incomes, housing issues still impact workers in these neighborhoods. In Westchester and Playa Vista, two neighboring communities on the Westside of Los Angeles County, 11% and 15% of residents work in PSTS respectively, and there are 6,780 PSTS jobs across the two neighborhoods according to 2015 LODES estimates. The median income across the two neighborhoods is $91,676 according to 2016 ACS 5-year estimates. Despite having a much higher median income than the county average, residents in Playa Vista and Westchester still face housing challenges. Just half of residents across the two neighborhoods are homeowners, and half of the renters across the two neighborhoods are cost-burdened. For residents of Westchester and Playa Vista, working in PSTS may put them at an advantage compared to workers in other industries. The 2018 LABC/Price Center report found that employers in PSTS are more likely to reflect high costs of living in their hiring packages. 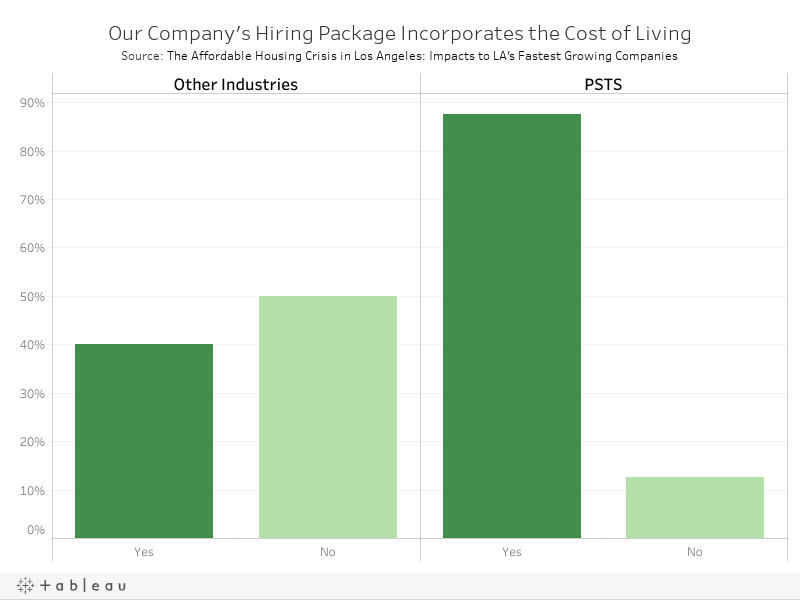 Nearly 90% of PSTS firms surveyed in the Los Angeles area reported incorporating cost of living into their hiring packages compared to just 40% of firms across other industries. For Los Angeles residents working in other industries that don’t consider cost of living in their compensation, and often pay lower wages, housing burden often becomes much more pronounced. AFS employees include cooks for fast food and other restaurants, hotel clerks, and waiters/waitresses, among others. Nationally, workers in AFS working 40 hours per week can expect to earn an annual wage of just $31,500. However, many workers in this sector are earning even less than that, as the average number of hours worked per week in the sector is only 26.5. In Los Angeles County, neighborhoods with the highest percentages of residents working in the AFS sector are heavily concentrated in the southern and central part of the county. Lennox, a neighborhood located directly next to Westchester to the east, has the highest percentage of residents working in the AFS (17%), apart from Catalina Island, according to 2015 LODES estimates. The median income in Lennox is just $35,300. Further, 72% of households in Lennox are renters and nearly 60% of renters are cost burdened according to 2016 ACS 5-year estimates. The 2018 LABC/Price Center report found that residents working in the AFS sector — primarily entry-level and low wage employees — face the greatest strains from the high costs of living and housing, yet seem to receive the least housing-related assistance from employers. Evidence from surveys suggests that some important financial benefits are only available to the highest earning, highest skilled staff. For example, 27% of employers reported that they adjusted only some of their hiring packages for the cost of living, further underscoring the vulnerability of low-wage workers. Although employers recognize that high living and housing costs in Los Angeles pose a problem for attracting and retaining workers, few are taking steps to address the concerns. The recent LABC/Price Center report found that only 17% of business respondents in the fastest growing industries incorporate the cost of living into their hiring practices. Furthermore, 44% indicate that their company does not set salaries by taking into account the cost of housing. Firms in Professional, Scientific and Technical Services are more likely to offer salaries that reflect housing costs in L.A., but these firms already offer higher paying positions for an educated and professional population. Employers may be able to alleviate housing burdens and long commutes from their employees by creating a supply of workforce housing or supporting the construction of housing. Major tech companies, such as Google and Amazon, are already building workforce housing as one way to help businesses attract and retain talent while relieving some pressure of the nearby housing market. Public sector employers in health care and school districts are investing in affordable housing projects and mortgage assistance programs for their employees. The Taylor Yard Transit Village is a best practice of public-private partnerships coming together to create a mixed-use, mixed-income housing project for a working class neighborhood in the City of Los Angeles. The project was developed through LA Metro’s Joint Development Program to build transit-oriented developments on Metro-owned properties. Slated to be completed by 2021, the project will provide 400 housing units, 30,000 square feet of retail space, and 2½ acres of open space. Implement new hiring policies that allow for employees to telecommute or work flexible hours. Provide employer-assisted housing programs such as rental or mortgage assistance, homebuyers education and counseling, and relocation incentives. Target corporate philanthropic efforts toward addressing the creation and prevention of affordable housing. Negotiate priority leasing agreements for their employees in office-adjacent developments. Advocate on behalf of specific legislation that would allow for increased housing density in areas within close proximity to public transit. Government actors can also think creatively about the way affordable housing is subsidized and identify revenue streams to finance housing development. Through interventions and partnerships, county and city officials can help promote the following recommendations. Provide discounted ground-leases, and extend the duration of current leases. Establish tax abatement programs for developers and owners of multifamily buildings who set aside a predetermined number of income-and-rent-restricted limits in new and existing buildings. Leverage tax incentives from the federal Opportunity Zones Program to spur investment in affordable housing. Identify new revenue streams to finance affordable housing, such as a percentage of the Transient Occupancy Tax (TOT) or Linkage Fee. Encourage short-term rental companies (ie. Airbnb, VRBO) to create a new user fee that would be diverted into the Affordable Housing Trust Fund. Reduce local barriers to limit delays and streamline the approval process for affordable housing development. LABC works to build broad-based coalitions of business, nonprofit, academic, environmental and union organizations with the goal of promoting environmental and economic sustainability for our region. LABC is renowned for its effective advocacy and educational programs throughout the region, and is a vital representation of business leaders from all industry sectors. Chiland, Elijah. What salary do you need to afford a home in L.A.? Curbed Los Angeles. May 2017. Lopez, Steve. Her six-hour commute each day seems crazy, but her affordable rent is not. L.A. Times. December 2017. Los Angeles Business Council Institute Report. The Affordable Housing Crisis in Los Angeles: Impacts to L.A.’s Fastest Growing Industries. 2018. U.S. Bureau of Labor Statistics, updated October 2018. A recent survey found that 78% of full-time American workers are living paycheck-to-paycheck.